Would you love to leave a colored track in the white sparkling kingdom of snow? 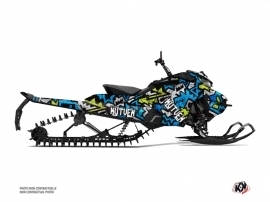 It has never been so easy as with Kutvek Kit Graphik’s expertise: snowmobile graphics is our specialty. 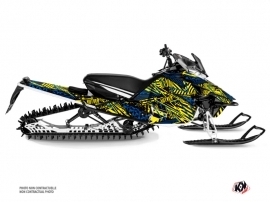 We create a unique appearance for the skidoos since 2005, thus we can dress your beast in the color explosion that will disperse the winter mist. No matter if it is for recreation or snocross, Kutvek stickers are wear-resistant in all circumstances. Owing to special material, we manufacture thick decals that defy the frequent contact with snow and ice. You can safely cross the snow-covered deserts: your bodywork will be well protected by the patented method of our snowmobile wraps. Our huge advantage is a possibility to propose you 100% custom graphics kit. Cover each component of your motor sled – front panel, front side panels, tunnel – with a graphic creation in your style. 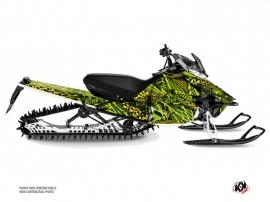 Give it a go and surprise other sledders with a jaw-dropping design of your snowmachine! Kutvek do not stop inventing new graphic collections for Yamaha snowmobile, Polaris snowmobile, Arctic Cat or Ski doo. Get inspired by our designs Dizzee, Keen, Aztek and do not hesitate to contact us for colour change – there are no limits for options and everything is feasible for our high-class designers. Our personnalised stickers are easy to apply, as vinyl adapts perfectly for any snowmobile relief. To assist you with laying of decals, we have created a special page “How to install a graphics kit”. 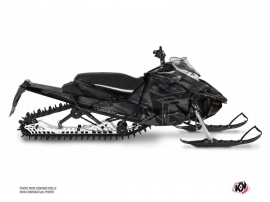 Well-equipped with our experience, we check manufacture of our Yamaha stickers, Ski doo graphics, Arctic Cat wraps at each step of production down to final shipping. This serious approach allows us to provide with you one of the best products on the market.